Over the past few months, downtown Salt Lake’s Bistro 222 has undergone some major changes. Most notably would be the hiring of new Executive Chef Brady Gray, formerly of Ruth’s Chris and Baci Trattoria. Gray’s past work experience in contemporary American and Italian cuisine fits nicely within the metropolitan environs of the 222 Main Building. It’s a great spot for tenants to meet for business-related meals, and the menu even includes limited takeout options for those who are on a tight schedule. Bistro 222 also boasts a Wine Spectator–designated wine list of over 150 vintages from all over the world. 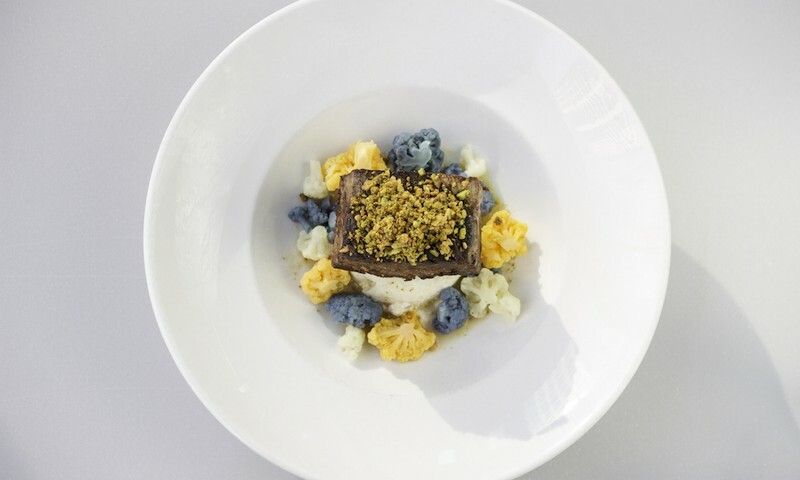 As the restaurant has already nailed down a solid following among the urban workforce, Chef Gray’s new and exciting changes are geared toward making Bistro 222 one of downtown Salt Lake’s dining hotspots. 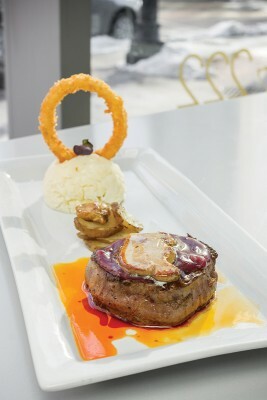 Bistro 222’s Ribeye’s miso-glazed foie gras and blueberry demi-glace achieve a contrasting effect. Based on my early experience with Chef Gray’s new menu items, his culinary game plan is perfectly clear. He’s packed the menu with several rustic, comforting entrées that have been reimagined with thoughtful flavor combinations. While some of these dishes are more successful than others, it’s the type of menu that one would expect from a higher-end, metropolitan bistro. A few notable starters were the Elk Tenderloin Carpaccio ($19) and the Lobster Bisque ($10). Using elk tenderloin as the foundation of a carpaccio dish is a deceptively simple idea, and I’m sure that this will eventually be imitated elsewhere. Sliced razor thin, the elk’s natural leanness is a beautiful canvas for the lemon oil and drunken cranberries to play with. The dish is also kissed with a bit of Peri-Peri sauce, a spicy Portuguese condiment that delivers a nice kick to the senses. The Bisque was exactly what I was hoping for—creamy, indulgent and subtly flavored with fresh lobster. For lunch, the Beet, Pear, Chèvre Salad ($10) and the Bistro Burger ($15) are solid options that fit nicely on both ends of the midday meal spectrum. The salad comes beautifully plated on a Pollock-esque smattering of beet juice, and the tangy chèvre serves as a great bridge between the sweetness of the pear and the earthiness of the beets. The burger, made from a mixture of ground chuck and pork belly, is immense and satisfying. With toppings like avocado, gooey Muenster cheese and candied bacon, each bite conjures up some lovely flavor combinations. It’s definitely the type of burger that needs to be sliced in half and eaten in well-planned bites. Since Bistro 222’s location has such great potential to be a necessary stop on a weekend adventure downtown, I wanted to see how a typical Friday night dinner would play out. My first bit of advice would be to make a reservation beforehand—the space fills up pretty quickly during the dinner rush. Service was polite but preoccupied—understandable for a busy Friday night. The star of the evening was the Korubuto Pork Chop ($30), a pleasantly monstrous cut of pork that made me rethink the dimensions of what a pork chop could be. The cut of meat, served bone and all, captured the tender juiciness of a ribeye steak but with the velvety flavor of a pork tenderloin. The yams and haricot verts gave this dish a distinctly autumnal feel. The Beef Short Ribs ($26) were another wise choice. The crimini mushroom consommé was a fantastic complement to the ribs, and all of those corresponding flavors soaked into the silky smooth cauliflower potato mash. Both dishes offered up expertly cooked meat that was paired with well-balanced sides—it’s definitely the kind of food that tastes especially good on a chilly winter evening. As far as the menu’s heavy hitters go, it’s tough to choose between surf options like Chilean Sea Bass ($38) or turf choices like the Ribeye Filet ($45). Both dishes perform like a well-cast film—the main dish is in no way overshadowed by the supporting cast, but each member brings something special and irreplaceable to the party. With the Sea Bass, the bed of braised oxtails and fingerling potatoes was instrumental in complementing the delicately cooked fish. 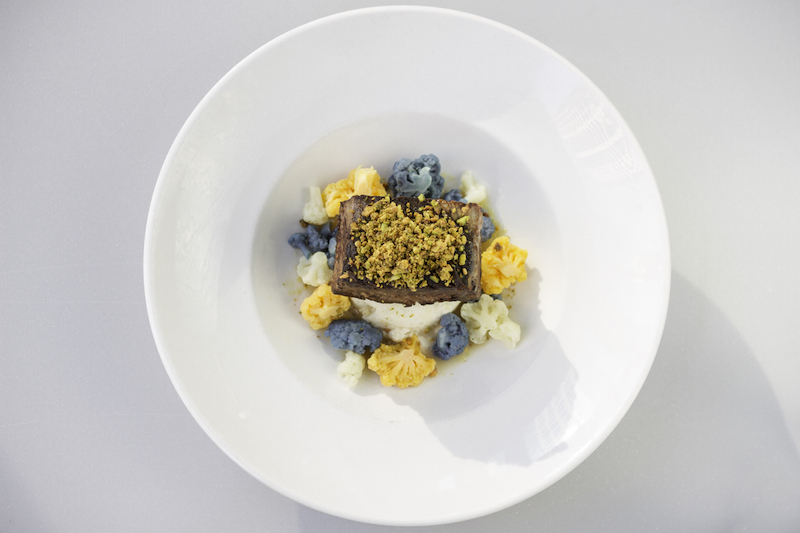 The Ribeye’s miso-glazed foie gras and blueberry demi-glace achieved a contrasting effect, offering small bursts of corresponding flavors to the richness of the Filet. While Chef Gray’s menu is a testament to his ability to combine flavors, there were one or two executional missteps along the way. For example, the Osso Bucco ($31) appeared to be lacking the sauce or marinade that usually accompanies the dish, making the generously portioned pork shank uncharacteristically dry. I loved that it came served on a bed of flat noodles as opposed to risotto or some kind of root vegetable puree, but I found myself wanting a bit more moisture to tie everything together. Given its proximity to the heart of downtown Salt Lake, Bistro 222 fills a specific niche for Salt Lake’s nighttime culture. It’s right across from Gallivan Plaza, and it’s the perfect distance from Capitol Theatre—a short jaunt down Main St., and theater-goers can grab a tasty bite to eat while avoiding the pre-show foot traffic. As downtown Salt Lake continues to evolve, Bistro 222 is beginning to cater to both Salt Lake’s 9-to-5 workforce as well as the members of its vibrant nightlife.